OUR GREAT GRANDFATHER NAMED TEODOR VUJIĆ FOUGHT FOR THE AUSTRO-HUNGARIAN ARMY IN THE FIRST WORLD WAR AND DIED SOMEWHERE IN THE ALPS. FZ: An important part of your practice deals with questions related to the museum and the collection. Your work interrogates in different ways the ‘identity’ of the museum, the value of its existence, the importance of the objects collected. By doing this you often subvert the museum’s conventions so as to question the established cultural policies. As part of the project Muzej Umjetnosti Prnjavor (2009-2012) you enquired about the opening of a new museum from the inhabitants of your home city of Prnjavor, Bosnia and Herzegovina, a museum that actually was a fictive one hosted in an abandoned house. 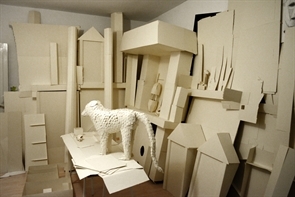 More recently, with Inside of the Para-Site (2015), you have constructed with cardboard a museum in your flat in Berlin and shortly afterwards you have demolished it. Your work, thus, directly and critically address notions of culture and heritage and how they are preserved and displayed. How did you come to question these particular aspects of our common cultural heritage? JF: At some point in my research it was not enough for me to deal only with the individual psyche. When I understood that I don’t keep the situation under control, I started researching and questioning the repercussions of geography, education and class on the construction of taste, opinion and way of life. For me creating art doesn’t mean to trigger emotions, sensations or cognitive processes, or to serve didactic purposes. Art for me is about what is unclear, incomprehensible and dissonant. This is why the work I do has become a field of research into socio-cultural structures. My practice started to be ever less object oriented and more complex to the point that sometimes it is difficult to disentangle the beginning from the end. In the examples you mentioned, the subversion of the museum’s image happens through the institutional critique and subsequently through a critique of that critique. It starts as one thing and then it continues and changes into another. I am questioning the institution as a man-made structure of physical and symbolic value, the museum as a criterion of our society, as a place to start doubting in what is represented as a norm, in what is good and valuable. I think the museum is a perfect place to start that kind of thinking. It is a place where we can see that the ideas we consider to be contemporary have existed long time ago and have set connections to social standardisation. It is also a place where you understand that the absence of things, objects and stories does not signify the absence of meaning. I make museums as antithesis of museums’ structures, as para-institutions where the constant uncertainty about what we are seeing is in the foreground. The important question here is: Is what we see really a truth? This was the beginning of a work in progress that has now taken the form of a museum/archive that was presented again in 2016 as an installation, but gathering more objects and documents. 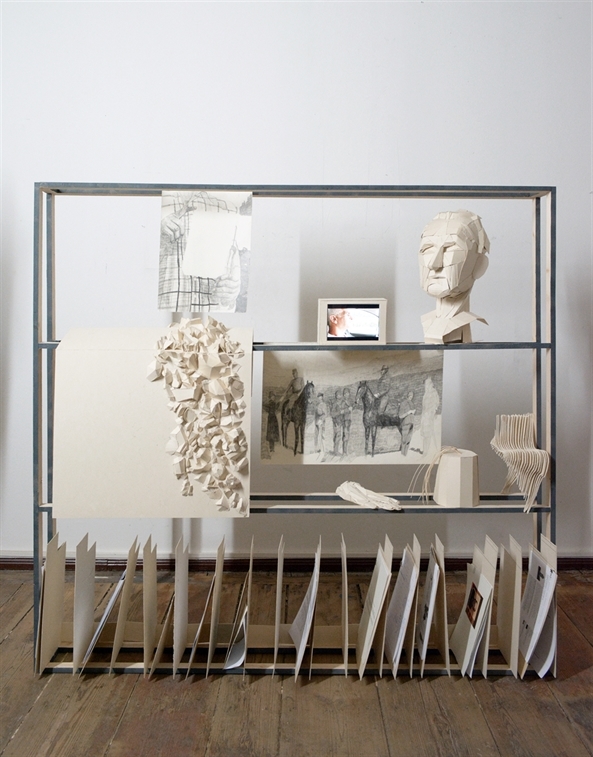 This archive is still visible online and takes the form of a digital desktop. The character of Teodor brings together a discourse about the familial myths and heroes and a narrative crossing questions of identity in the changing geopolitical context of Bosnia and Herzegovina during the last 100 years. Your interest in this enigmatic and mysterious relative grew up from the stories recounted by your grandmother, and you have also asked your father to narrate his own memory about Teodor. What your memory about these memories looks like, Jelena? My memory is constructed through the memory of other family members, mostly my grandmother. Their memory also did not come as a first hand experience or from knowing Teodor. The witnesses of that time are long gone, so the story was transmitted orally. For me this was almost a fiction. I never heard anything else but the couple of sentences: that he fought in WWI in Austro-Hungarian Army and died, supposedly somewhere in Alps, most probably in Tirol, and that his grave exists somewhere in Austria with his name and date of death. All that I know about this came through long way of telling and retelling the same story from one generation to another. There are no photos or documents proving that Teodor ever existed. In a story with so many gaps and unknown facts, my mind keeps filling it with the official historical facts learned at school or at the museum. Between these facts and my family’s memories there is an unreadable and inexplicable knowledge that I am trying to grasp by creating this archive. My aim is to collect documents and traces of existence and bring them together in a museum/archive-like form, so as to enable different readings when all these elements come together. As already said, my memory of Teodor does not exist, but I do remember the ponderings, amazement and curiosity I always had when his history was told. I guess it had to be addressed at some point in a more complex and active way. I was not only interested in this tension that takes shape at the border between fiction and reality, rather, and from early age, I was attentive to the understanding that people can be used for the purposes of powerful forces. In these last two years of working on the project, you visited archives and war museums, and selected documents, images and objects that allowed you to start to fill these gaps and to bring some historical answers to the mystery of Teodor’s life. Would you tell us about the progress of your research? My grandmother believed that Teodor’s gravestone exists somewhere in Austria. It is supposed to bear his name and the date and the place where he died. 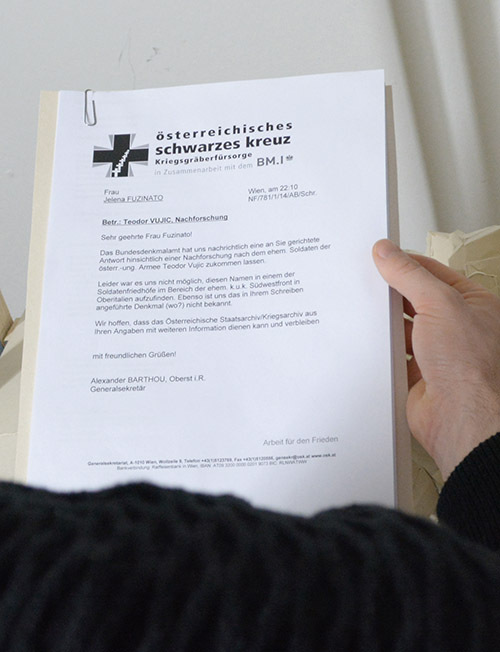 I kept correspondence with the Österreichische Schwarze Kreuz, the Austrian association which deals with the establishment, maintenance and preservation of graves of fallen soldiers, civilian war victims, refugees and politically persecuted people of all nationalities. In their archives the soldier named Teodor Vujic never existed, but they indicated me other institutions where I could find more information. So I started corresponding with the War archives in Vienna and I am planning a research trip in Vienna, where I will continue the work. My research took me to the municipality of the village of Kokori, where Teodor’s son was born. I tried to find Teodor’s birth certificate, but without success. The State registers are incomplete due to the damage they suffered in the the fire during WWII. 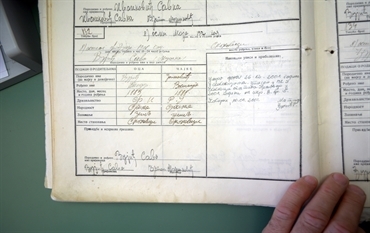 What I did manage to find is the birth certificate of Teodor's son, Savo. This is the first and only official document that proves Teodor’s existence and the only document that shows his name. It also shows a couple of other informations, that Teodor was born in 1889, that he was a farmer, that he was married to Vasilija and that they had other children, all born before WWI. His son Savo was born in 1908. According to my grandmother's story, Teodor was taken to army by the time his son was 3 years old. That is to say that I was able to compare the facts from both testimony and official documents. In this case, informations from my family’s memories and from the State's Registers overlap. In 2015, I have made further research at the Herengeschichtlichemuseum Wien [Vienna’s War Museum]. This museum gathers many objects from WWI including the car of the Archduke Franz Ferdinand or the suit that Ferdinand wore on the day of his assassination, as well as many artefacts that are of symbolic value for me, such as paintings or drawings depicting different divisions of the k.u.k. army [kaiserlich und königliche Armee, the Imperial and Royal Army of the Austro-Hungarian Monarchy]. These works by war painters show differences in the uniforms, physiognomies and statuses of specific divisions from different regions. They present anonym soldiers, while giving a precise factual visual description of them. I have used these drawings and paintings as a key milestone upon which building some visual elements of the installation. The research at the War Museum opened new trajectories from the moment I learned about the Bosniaken [the German name given for the bosnian division]. The installation and the collection of the objects have been outlined and I have now the material to start the second phase of the work. During this stage of the research I started presenting the archive to the public, thus enabling a dialogue with more people and including the testimonies told by the descendants of the WWI soldiers. Besides, further research made in the national archives both in Bosnia and Herzegovina and in Austria, is outlining the official narrative of the historic events. There is something interesting you were speaking about before. 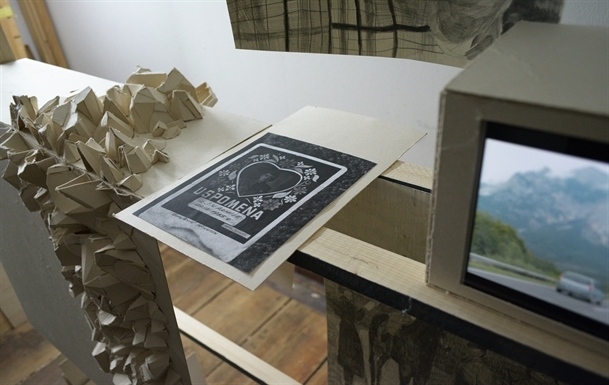 You told that the aim of the Archive of Teodor Vujic‘s project is to enable different readings from all the objects and texts assembled. I have noticed this in confronting with the different languages gathered within the project, such as the Bosnian spoken by your father in the video presented (that you have deliberately not subtitled), or the German archival documents. Thus, my imagination was called to shape its own version of your father’s story, and it’s the same with the letters written in German. While you are collecting elements so to grasp and weave your knowledge about Teodor’s story, you are bringing us to play your same game. I think this game is also interesting because it plays with the losses, changes and uncertainty brought by oral stories, and the visitor itself is confronted to this and he is forced to re-appropriate Teodor’s story with its own imagination. The work is designed as an archive because it strives to present the documents and objects as valid evidences of a certain time and a certain history. By now, the archive is actually a collection of documents, objects and films that has a common determinator, the history of a man who happened to be my great grandfather. By starting with the archive, it is inevitable to be confronted with all the complexities and challenges that this kind of accumulated knowledge brings with it. The language is one of them. When researching I am using whatever language is necessary to find out more, to learn more or to communicate better. But when it comes to the presentation, a conscious decision has to be made: In which language do I want to speak here? At the core of this collection of things there is a will for knowledge, and a hope that the new constellation of objects will give a perspective that enables a better understanding, now and here. My “now and here” is connected to the languages I am using, which are the hegemonic languages that allow me to communicate and understand better. These languages are not my mother tongue, so instead of translating or playing the role of a (cultural) translator I am offering the possibility to read the archive for yourself. The decision not to make order was conscious too. We know that the complete, homogeneous and systematic archive would not be any more truthful or understandable than a non systematic one. Thus, by choosing to present all the documents in their original language I also choose to invite the viewer to listen with her/his own senses and to move through the archive in any way that is not driven by my own narration. Which is also the experience you described. The challenge is to extract the essence from the content that has a potential to describe identity, to understand the historical preconditions of order of things and people, to try to be able to say something that was not sayable before. Therefore homogeneity of language would not help to make it more understandable. A systematic archive is often an abstract thing, in my opinion. When I think to a classified archive, I think to boxes, folders and drawers, an archive which exists in its own identity and for itself. An archive whose content is not immediately and spontaneously visible. Displayed, the archive is always the result of a process of selection which brings chaos into its classificatory system, while it opens to new meanings and interpretations. 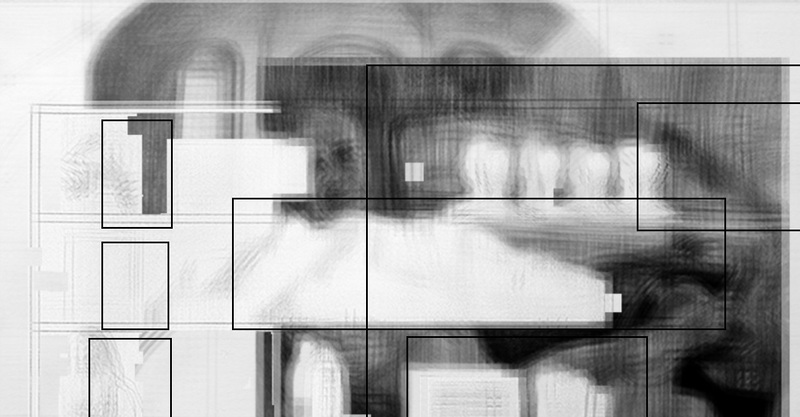 The visual dimension of the archive excludes its systematisation, its contents can be stressed and manipulated in different ways… In the display you imagined for the online version of your archive/museum, the objects and documents presented are not immediately visible, they are blurred as if they were asleep in the deepness of memory. But they appear when we bring our attention to them, by passing over or clicking with the mouse cursor. This display relates to the history of Teodor, its losses as well as to a blurred memory, but makes me also think to a newborn archive looking for its identity to be shaped from the reconstruction of the past. We tend to think that we understand the things better when they are named and categorised in a certain way. Order and systematic approach is the foundation of our (informational) knowledge about things. But if we had to think about the world in this way, this would mean that a great part of it would not exist. Teodor would not exist. Naming these project a museum or archive allows me to communicate to people and show with a greater understanding my intention. The problem with this is that it resists the classification and asks for messiness, although I am trying to precisely draw within an historical condition. The collection is set up as digital desk. I use it almost as I would use a working table or a wall, putting pieces together, blurring them, coming back to them and setting connections between them. You will notice that there are also frames and dedicated places for pictures and texts but they sometimes do not fit or are left empty. What happens when you cross from one object to another is a visual effect that helps in producing the feel of a blurred memory and to focus on one part of it. It also intends to show the discarded elements and accentuates the voids between them. The fact is that this is nobody’s memory. It is produced through social norms, just like any other heritage. There are many definitions that can be given to this project, which can also recall the way of processing research in the visual way Aby Warburg experimented in his Atlas of Mnemosyne. There is one thing that unites all these definitions: the act of collecting. This simple action of gathering objects or documents together is the premise of curiosity cabinets, atlases, museums, archives and libraries. A collection is a way of thinking and representing the world and its knowledge, and any display of a collection allows to open different points of view and associations between things. It is interesting that you are speaking of heritage. The personal story which is at the beginning of this project is expanding in the field of a collective memory. And even if in your digital desktop you present a video of your father recounting the story of Teodor, this can be seen as a voice recounting several similar stories. You are producing a knowledge that will be shared and felt as a common knowledge. Also, your decision to present this project on the Internet is probably a way not to enclose your archive/museum in a given temporality or space. It is a common knowledge that can be accessed by everybody, everywhere. Yes, it addresses common knowledge and collective memory. This research contributes to the enormous number of men involved in WWI. While searching for Teodor I also found, sometimes intentionally sometimes unintentionally, other members of my family, as well as Teodor’s friends and colleagues. There are many similarities between their stories. There is a common denominator between almost all the families whose ancestors had lived on the territory of Bosnia and Herzegovina in the period between 1914 and 1918. So I think that telling a story of one single man can contribute a great deal in understanding the larger picture. Just as well as the destiny of one individual, no matter how small and irrelevant it may seem, influences the whole collective. What I mean here is that with this single example I am trying to understand how the soldier of the WWI became an heroic figure and how it gets to be forgotten in such a way Teodor was. The soldiers of the Bosnian division during WWI are not shown as individual human beings, but as a component of the great machine. Their desires, unpredictabilities, failures or individual ideas did not find the place in the representation of the historical narration. This became obvious to me in the War Museum in Vienna. What does this representation show us? Is this another proof of how marginalised and unprivileged societies are used as “cannon meat”? Does the story have another potential besides understanding powerlessness of a single man in the play of great forces? How can it be compared to the situation today? Can it be empowered? Many voids exist in the archives, museums or collections. Acknowledging them is already a big step in addressing the exclusion and partial storytelling. It is not unfamiliar that the history of the Balkans has not been told carefully in many aspects. So for me speaking about this void is taking common knowledge and collective memories and giving them a visual space. Although choosing the Internet as a working space has made the access to my research more visible, this was not my priority. My initial idea was to enable intertextualities and use the digital archive as a gathering point for pictures and words. In the digital desktop presentation of the project, some pictures and links are going to take you to an abundance of data. That creates a kind of material visual space as a form of metaphoric thought. The archive has its material form so it is possible to read it not only as a hyperlinked online archive but also as a material object in a space that has its qualities, as well as informational abundance connected to the online and offline resources. Having all this information online makes the elements of the archive more visible to me and makes it more approachable to others. It creates the tension between words and images that complicates a more linear narration. I tried to make it as a map of memory, I would say as “coordinates of memory”, for you mentioned Aby Warburg and his Atlas of Mnemosyne. Before to end this conversation I would love to hear from you about the idea that brought you to realise Archive of Teodor Vujic both online and offline. Indeed, your project in some way has a resonance with past forward. This online curatorial project was created with the aim of having the virtual space of the Internet questioned and used by visual artists, and to connect their site-specific projects to a larger network of knowledge gathered in the Web, so as to implicitly refer to their research-based practices. You are the first visual artist I am working with who is concerned by the different challenges of displaying a work online and offline. 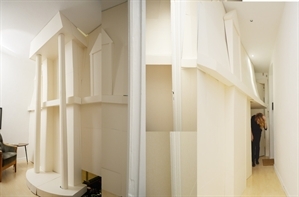 Would you tell us how did you decide to give Archive of Teodor Vujic these different shapes? The argument of an experience that is both virtual and physical is one of the key concepts of the present when I happen to create my work. On one hand, the digital enables a smooth virtual experience and makes it easier to have an almost interrupted flow of information. On the other, this easiness is exactly what makes me unsatisfied with it. I can make whatever I want it to be, but I also need a confrontation, the opposition that would make it visibly discursive. That is why I am still working in a digital format, but at the same time I need to create a real space of physical experience, a contact zone where the imperfect bodies and minds meet, look, think and speak. So the tension of this work lies between two different sorts of information - on one side a digital, virtual, omnipotent information, and on the other side an analogue, historical, faulty, material world. I enjoy acting at this border between reality and virtuality, which not only exists in the format I choose to work with, but also lies in the core of the work.